I’ve been wanting to make the large Swoon block by Camille of Thimble Blossoms for a while, but didn’t have a specific project in mind. I did use the mini-Swoon block for my project in the Black Cat Crossing swap recently. 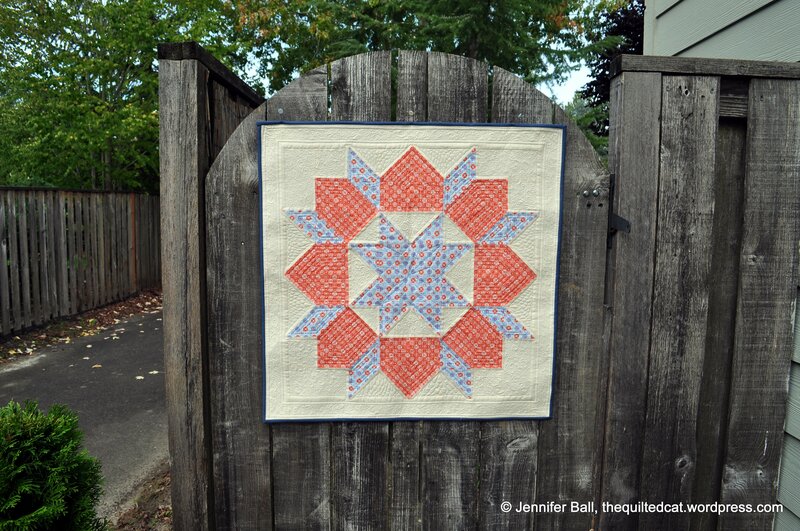 I participated in a 5-month Supernova friendship block swap with my new friend, Cindy of What’s One More Project. We have been making and sending blocks to each other since July using the Ansonia fabric line from Denyse Schmidt. October is our last block! So I decided to make a one block Swoon quilt for Cindy as a thank you. I used two fabrics from Sunnyside by Kate Spain along with Kona Snow for the background and a Kona blue for the binding. I did some pretty heavy free-motion quilting on my Bernina Activa 145. I had so much fun! 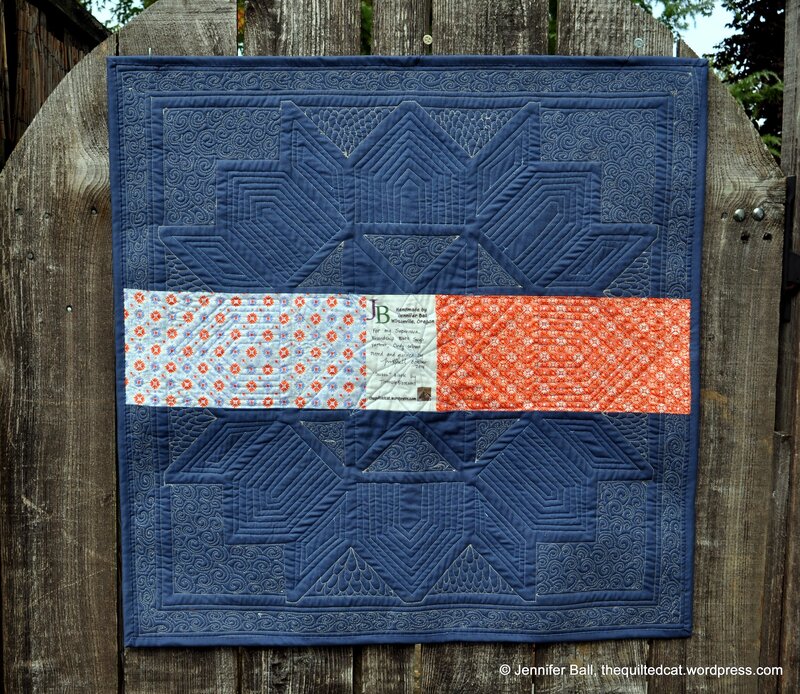 On the Sunnyside fabric, I used Stone Blue Denim Aurifil thread #3770 since it has a lovely variegated appearance. I used a cream Aurifil 50 wt thread on the Kona Snow portions. 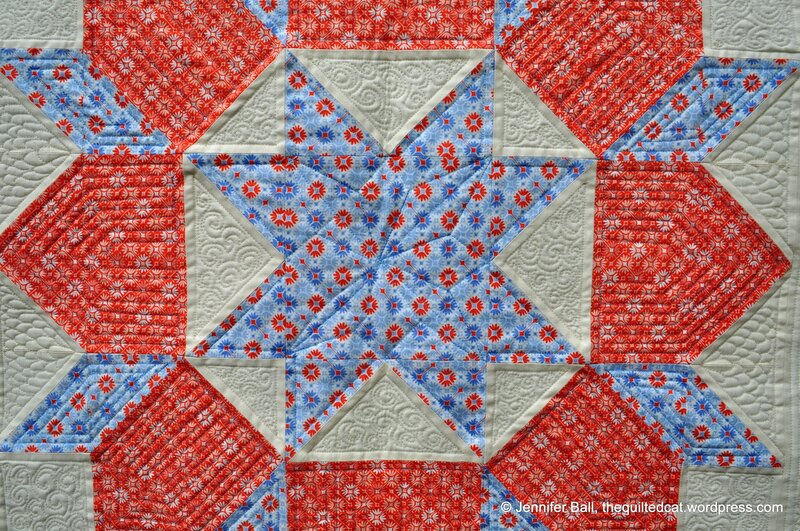 I did some straight-line quilting around the block edges and in the border. Inside the orange and blue block shapes, I did some more straight-line quilting. I really wanted the background to stand out so I did some swirls and some bird-feather like shapes in the Kona Snow. For the backing, I used the same Kona blue as the binding except for two strips of leftover Sunnyside fabric and a label. I really like how the stitching shows up on the back! I’m definitely going to make this block again since it has so many possibilities from a one-block quilt to a pillow to a bed quilt. 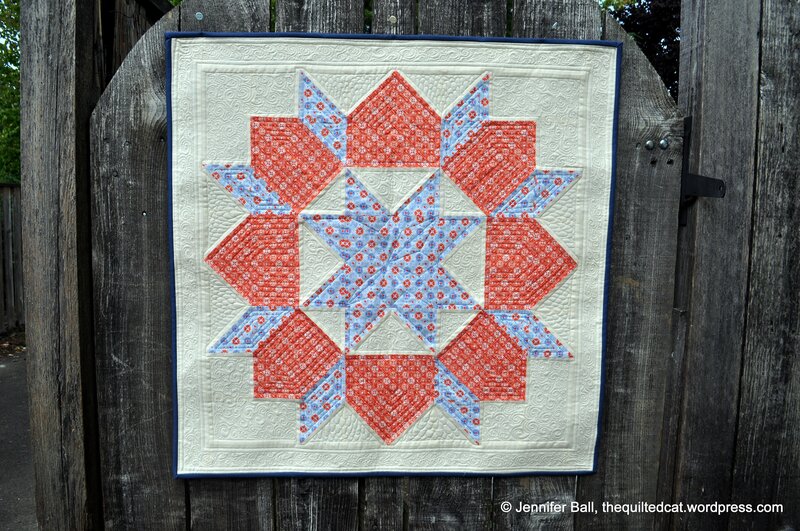 This entry was posted in Modern, Quilts, Swaps and tagged Aurifil, Bernina, free-motion quilting, Kate Spain, Sunnyside, Supernova Friendship Block Swap, Swoon block, Thimble Blossoms by thequiltedcat. Bookmark the permalink. You did a really great job quilting your Single Swoon! I had three left overs from my quilt that are also singles. Wow!! I’ve always loved the Swoon block but haven’t attempted one (yet). I love the idea of the single block and yours is absolutely gorgeous! 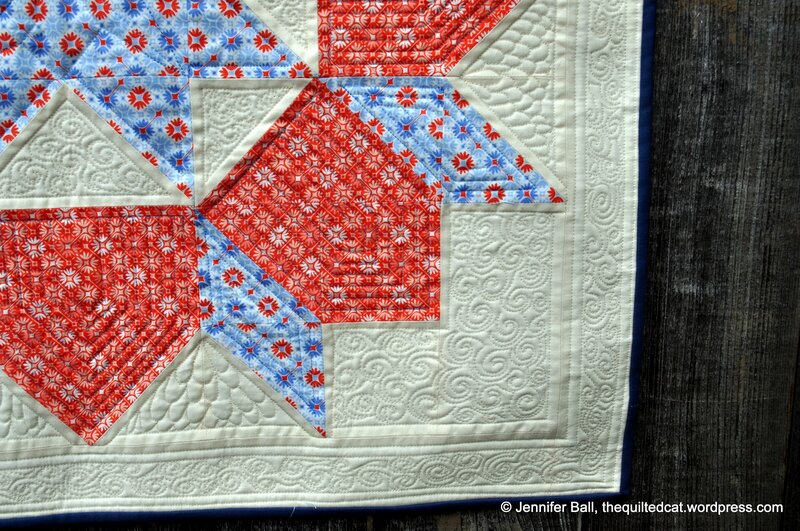 And your quilting … makes me drool!! Congrats on a stunning finish! That’s simply gorgeous. Thanks for showing the back! What a lucky friend. Beautiful!!! Your fabric choices are perfect and your quilting just takes it right over the top!!! Thanks for the picture of the back – shows all your fabulous quilting so well!! !